After Infinity War ended with half of the universe getting wiped out including our beloved Spider-Man, with the snap of the Mad Titan, Marvel has now dropped the first teaser trailer and the first poster for Spider-Man: Far From Home. The teaser trailer ensures that the adventures of Peter Parker is going to continue! Tom Holland returns as Parker in Spider-Man: Far From Home, the next chapter of the Spider-Man: Homecoming series! 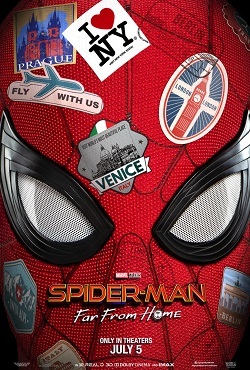 The friendly neighborhood superhero decides to join his best friends Ned, MJ and the rest of the gang on a European vacation. However, Parker’s plan to leave super heroics behind for a few weeks, are disrupted when he reluctantly agrees to help Nick Fury uncover the mystery of several elemental creature attacks, creating havoc across the continent! The trailer gives fans the idea about the subtitle along with what to expect of this superhero adventure. The film is to have appearances of few notable familiar faces from the Marvel Cinematic Universe, and more than one powerful new character – including Mysterio (Jake Gyllenhaal)! Holland had previously revealed on Jimmy Kimmel Live Spider-Man’s new suit – a black-and-red combo, as opposed to the traditional blue-and-red mix, with the spider logo on the chest area redesigned to look sleeker. Michael Keaton, Jon Favreau, Zendaya, Marisa Tomei, Cobie Smulders, Samuel L Jackson, Jacob Batalon, Tony Revolori, Angourie Rice and Hemky Madera all return for the upcoming film. Spider-Man swings back into theaters on 5 July 2019.